At Myles Nelson McKenzie Design, we are very happy to provide Ultrasuede fabrics to our clients. They create the world’s premier suede fabric! Ultrasuede as a fabric, is both child and pet-friendly. It will continue to look and feel luxurious to the touch for any custom designed furniture piece in the office, custom home or remodelled residence. Which of the Ultrasuede fabric lines are recommended for interior and furniture materials? Ultrasuede has two very fine fabric lines for interior finishes and furniture covering materials. The HP series comes in two variations, a solid color and a Jungle animal print. Both of which, have a soft and luxurious feel to the hand. What are the fabric performance and fabric highlights? We found at Myles Nelson McKenzie Design in Newport Beach California, that the fabrics from Ultrasuede really do offer superior resistance to wear and fraying for any furniture piece! It’s very suitable for use in any active centers of the home and/or office! This particular fabric works very well for wall coverings, furniture upholstery, slip cases, and Ultrasuede fabrics looks fabulous for draperies, pillow and cushion coverings. 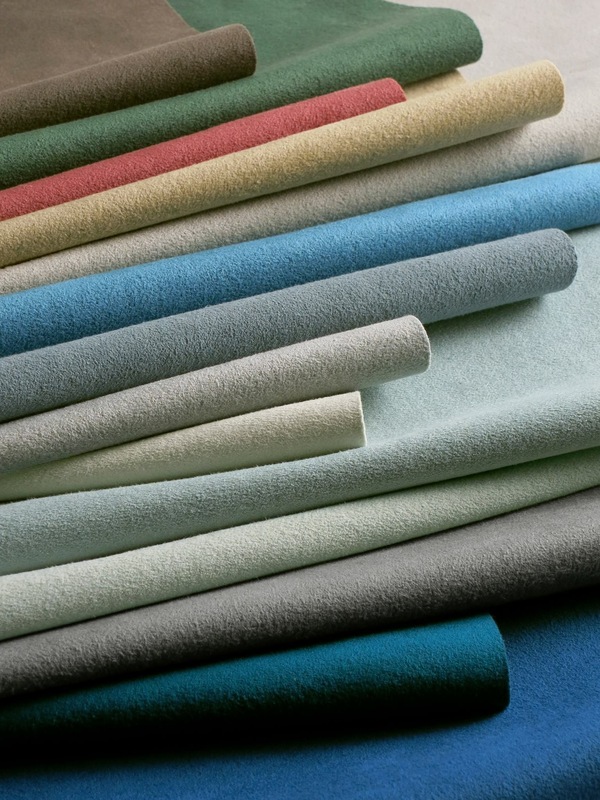 Ultrasuede® HP features ultra-microfiber made with recycled polyester. A soft, plush, suede hand. Soothing to the touch in any climate. Resists sagging, crocking, pilling and shrinking. Highly abrasion-resistant—exceeds 200,000 Wyzenbeek double-rubs. Spot-cleans and is easily washable. Unsurpassed range of today’s most sought-after colors. For fabric care and up-keep, click here for recommended fabric maintenance. Click here to view the full line of Utrasuede fabrics. Ultrasuede® is a registered trademark brand by the Toray Group.